Here is a photo that I made at sunset on the shores of the Dead Sea in Jordan. The view looks west over the sea and the mountains of Judea between Bethlehem and Jerusalem. 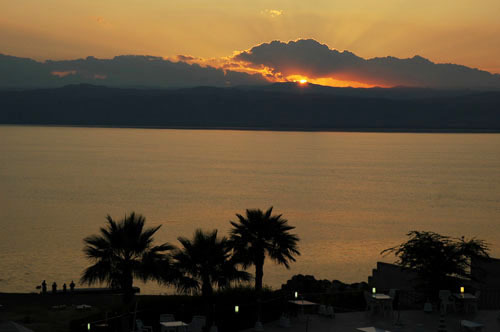 The Dead Sea is called the Salt Sea in the Bible (Genesis 14:3; Numbers 34:3, 12). The width of the sea at this point is about 11 miles. The level of the Dead Sea is now almost 1400 feet below [Mediterranean] sea level. This northern end of the Dead Sea is about 1300 feet deep.